(NaturalNews) It might seem kind of obvious to some people, but maybe not so much to others: if you lie to your kids, they are more likely to do the same when they grow up, according to a new study. An undergraduate researcher at the University of California-San Diego became the first to scientifically test the theory that lying parents can instill that "quality" in their children. Chelsea Hays approached her professor, Leslie Carver, with the hypothesis; the resulting research led the pair to publish their findings recently in the journal Developmental Science. "As far as we know, this is the first experiment confirming what we might have suspected: lying by an adult affects a child's honesty," said Carver, an associate professor of psychology and human development in the UC San Diego Division of Social Sciences. The pair tested 186 children aged three- to seven-years-old in what they described as a temptation-resistance paradigm. About half of the children were lied to by a study experimental, who told them that there was "a huge bowl of candy in the next room," but then quickly said it was just a ruse to get the child to come play a game. The others in the group were asked to come play without any mention of candy. The game asked children to identify character toys they couldn't see by their sounds. Sounds and toys were pretty easy to pair: a "Tickle me" audio clip for Elmo; "I love cookies" for Cookie Monster; and "There is a rumbly in my tummy" for Winnie the Pooh. One sound was a deliberately tricky exception: Beethoven's "Fur Elise," which is not associated with any commercially available character toy. When the classical music cue was played, the experimenter was called out of the room to, supposedly, take a phone call - leaving the children alone in the room for 90 seconds and tempting them to take a peek at the mysterious toy making that sound. The children were explicitly asked not to peek. On returning, the experimenter also explicitly asked the children to tell the truth. Cameras rolled the whole time. The results: The five-, six- and seven-year-olds who had been fibbed to were both more likely to cheat and then lie about having done so. 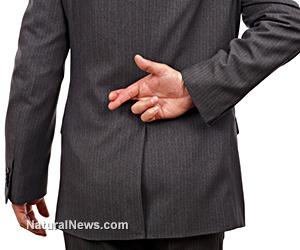 "When parents lie, and children see parents lie, parents become the child's excuse to lie," parenting expert Scot Conway, Ph.D., J.D., told NaturalNews. "Children will see the example, and it will make an impression." "The truth is, kids generally know right from wrong in their gut, but don't always listen to that 'little inner voice,'" writes Janet Lehman at Empowering Parents, a website offering parenting advice. "Conversations about right and wrong generally aren't going to solve the problem, but a problem-solving conversation can make a difference for that behavior now and in the future." "No question that in my vast experience with children and families, parents who lie to their children (as well as to other people) raise kids who are more likely to lie and cheat as young adults," Dr. Fran Walfish, a leading child, teen, parent, and family psychotherapist in Beverly Hills, and author of "The Self-Aware Parent," told NaturalNews. She said a 10-year-old boy she tried to treat once was incapable of trusting adults because of repeated deception by his father. Adds Lori Woodring, Ph.D., and author of "My Very Exciting, Sorta Scary, Big Move": "We know that all children lie - it is part of their development. We also know that children model their parents' behavior and that parents' install values in their children. If parents tell children not to lie but are telling 'white' lies or 'pro-social' lies themselves children observe this and get the implicit message that lying is really okay." One answer for parents, she says, is to "be imitation-worthy." Parents can check themselves daily, said child and parent behavior expert Dr. Sandy Gluckman. "Buy yourself a journal or notebook. Each night before you switch the lights off, let yourself think about the behaviors your children saw when they watched you today," she said in an email to NaturalNews. "Did they see you reach out and engage with others openly, honestly and authentically? Or did they see you pretend to be real, pretend to be honest, disguise the truth or even lie about something? "Write your honest and less honest behaviors in your journal (even if some make you cringe)," she continued. "If you recognize behaviors that you would like to change then consciously and determinedly watch out for these behaviors and start changing them."